This entry was posted on September 3, 2013 by Jessica Anderson. With the anniversary of Sept 11th approaching, our thoughts go to the memory of that tragic day and the loss our county endured. We remember the sacrifice so many made and are reminded of the selflessness of our military, police and fire professionals who risk their lives every day to serve us. It's a time to reflect on what it means to be an American, and recognize those that protect our lives and freedom. Do you know a police officer, fire fighter, EMT, military servicemember or veteran you want to thank for their service to our country or local community? Below are 3 ideas of ways to honor those that serve. Write a letter to show your appreciation. 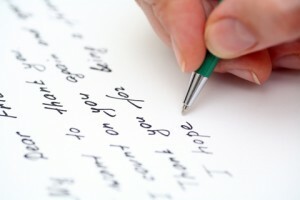 With this technological world we live in, handwritten letters mean even more than they did in the past. Consider writing a letter, whether to a service person oversees, or to your local firefighter or police officer. Speak from the heart to make it meaningful. It will make their day. There are hundreds of charitable organizations that support our military, veterans, firefighters and police officers. Local police and fire guilds, Yellow Ribbon Fund, and Wounded Warriors Fund are just a few of the many organizations that support the heroes in our community. Research a charity and then consider making a donation in honor of the person you are thanking. Here is a great resource if you are looking for ideas: Support Our Troops at Military.com. We have many ideas for patriotic awards, including plaques, crystal awards, and resin trophies. Eagles: A popular choice for military honors are eagles; these make great patriotic awards. Stars: Another great choice is stars, to honor our flag. We have many options for star awards, all of which can be engraved with your message. Plaques: We have a number of different plaques specific to fire, police, EMTs and military. What is nice about a plaque is that it can be displayed on a wall and enjoyed for years to come. What makes an award even more meaningful is the personalized engraved message you put on it. For engraving ideas, see our page, What should my engraving say. In honor of the anniversary of Sept 11, now is the time to thank our first responders, military, and veterans for serving our country and risking their lives day after day for our us and our families. Take action and show them how much you care!